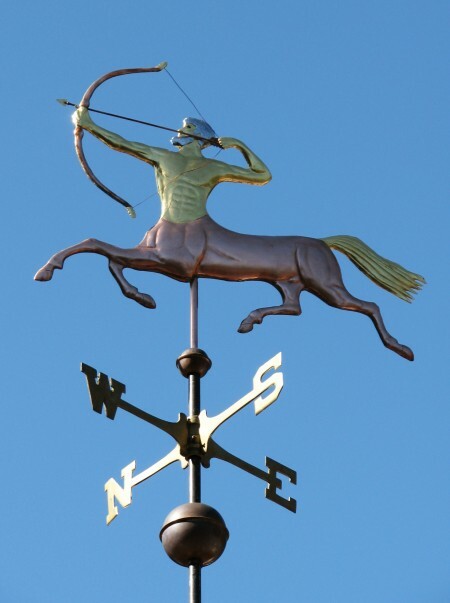 This Galloping Centaur Weather Vane showcases one of the most beloved figures from Greek Mythology. 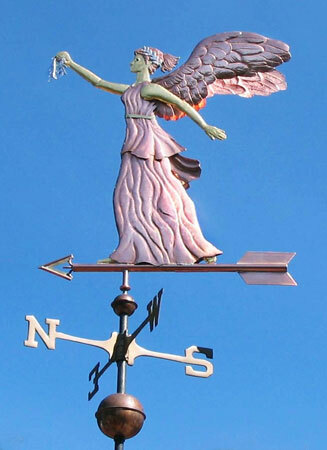 The customers who commissioned this weather vane had seen a 19th Century variation on this theme at the American Folk Art Museum of New York and wanted a similar weather vane for their home. We’ve revised the original molded design by A.L. Jewell, & Company to give it a little more sophistication. 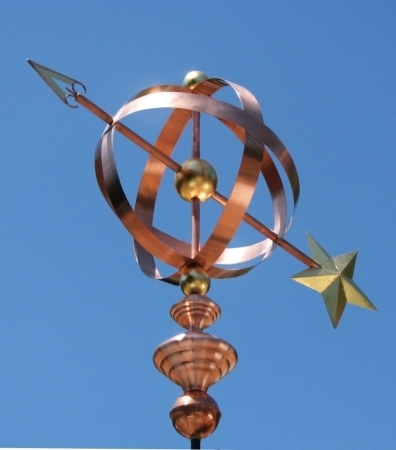 Their original weathervane was made using a technique called ‘mirror-image’. 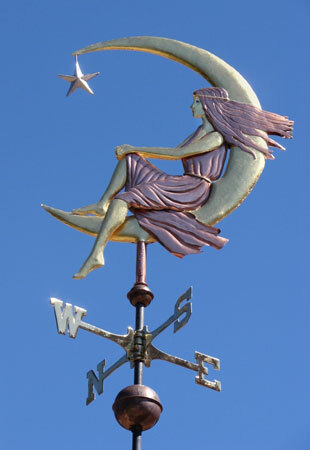 This means that the front side and the back side of the weathervane were identical. 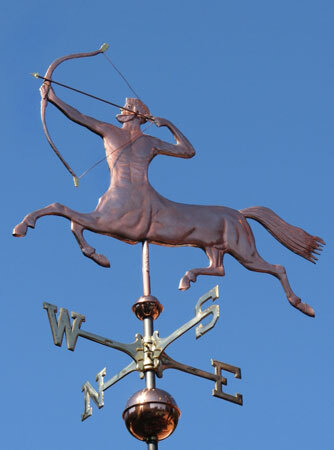 In the case of the antique weathervane, this was done to reduce the cost to produce it. A one sided mold is less expensive to make than one that has both a front and back side. 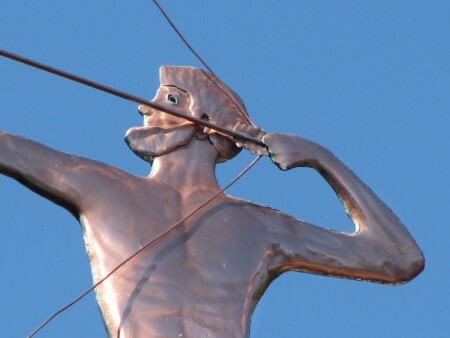 The glaring problem with using this technique is that when he is viewed from the ‘back’ side, the Centaur appears to be drawing the bow behind his head! 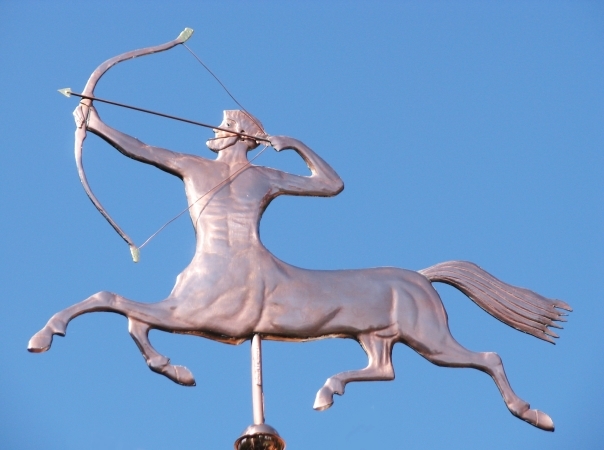 In our version, we designed the Centaur with both a front torso and a back torso. 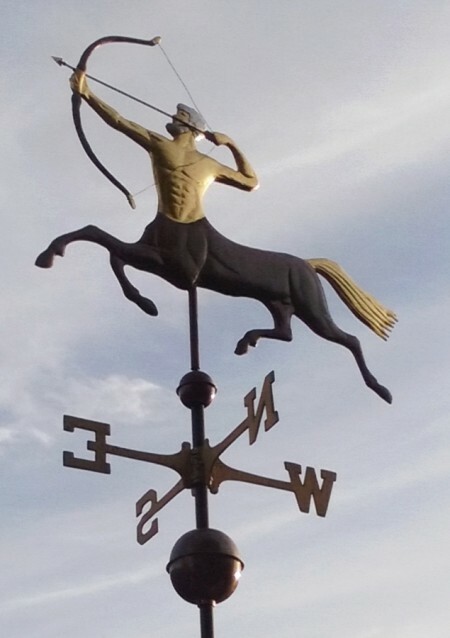 Because we do not use molds in our weathervane making process, we had the flexibility to work out the correct musculature, dramatic twist of his torso and the correct arm positions for each side of his body, with drawn bow always correctly oriented. 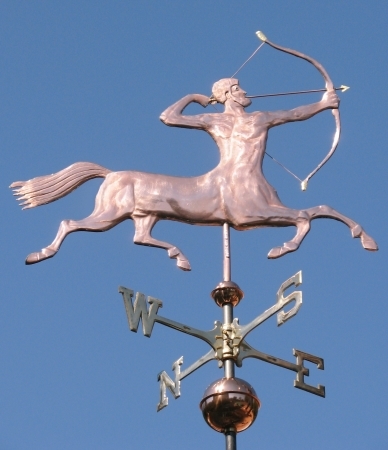 This Centaur Weather Vane is an addition to our growing series based on Greek Mythology. 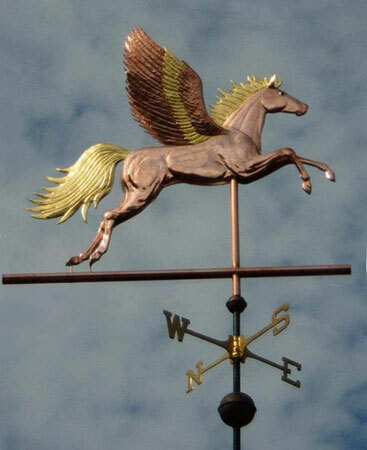 This series includes Zeus, Poseidon, Nike (Winged Victory), Pegasus and Goddess weathervanes. The stories that accompany each of these figures are still appealing and illustrative of the human condition even two-thousand years later and, as archetypes, remain popular to this day. 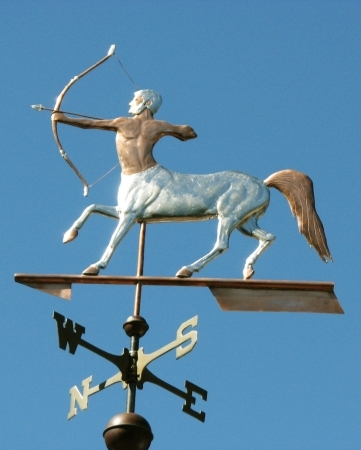 The Centaur is found in modern culture in Harry Potter stories, the astrological sign of Sagittarius, and as an emblem of various organizations and fraternities. 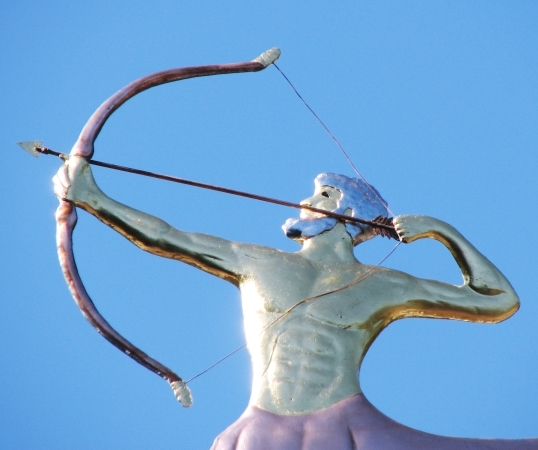 The origin of the Centaur is interesting. As a half human, half man creature, the Centaur was thought to have evolved from the reactions of a non-riding culture to nomads who arrived mounted on horses, possibly from the southern steppes of Central Asia. 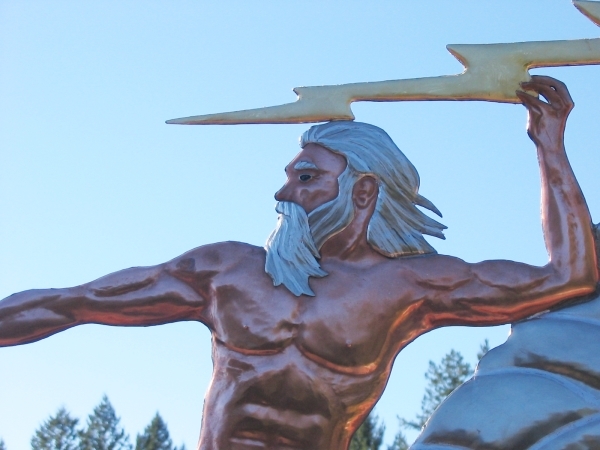 This half-human and half-animal composition has led many writers to treat them as transitional beings, caught between the two natures, embodied in contrasted myths, both as the embodiment of untamed nature, as in their battle with the Lapiths or conversely as teachers and healers, like Chiron.